An old-school, traditional space opera with a modern sensibility. “Bonadonna has constructed an empire and galaxy that largely escapes the looming shadow of Star Wars and Star Trek to exist as an original work in its own right. Three Against The Stars is a rip-roaring adventure ride.” — William Patrick Maynard, Black Gate Magazine, author of Lawhead, The Terror of Fu Manchu, and The Destiny of Fu Manchu. On the distant alien planet of Rhajnara a conspiracy created by the fascist Khandra Regime is set into motion to overthrow the rightful Rhajni Republic and instigate a policy of ethnic-cleansing. The conspirators are cunning and it seems nothing in the universe can derail their mad apocalyptic scheme. Nothing, that is, but three rambunctious Space Marines from the Third Regiment Company E of the United States Space Marines assigned to Rhajnara with the Terran Expeditionary Force. Sergeants Fernando Cortez, Seamus O’Hara and Claudia Akira are the most unlikely trio ever to don starhead camouflage and become military heroes. To their superiors they are wild, reckless and incessant troublemakers always in the thick of things. Yet their courage, loyalty and devotion to duty prove them to be the toughest Devil Dogs in the Corp. Now, with the aid of a Medical Corpsman named Makki Doon, a young Felisian native proto-feline humanoid, these three futuristic musketeers are about to become the one factor capable of exposing the traitorous Khandra coup. But to do so they will have to put their lives on the line one more time and risk all to save the day facing off against incredible odds. To save an empire they will truly become … Three Against The Stars. 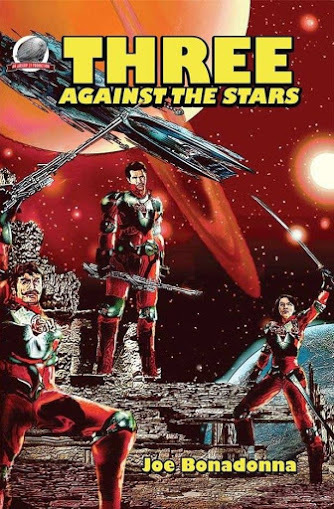 Published by Airship 27 Productions, Three Against The Stars is available worldwide in paperback, Kindle, and audio book editions. If you’d like to read William’s entire review, just click the link to Black Gate e-zine.